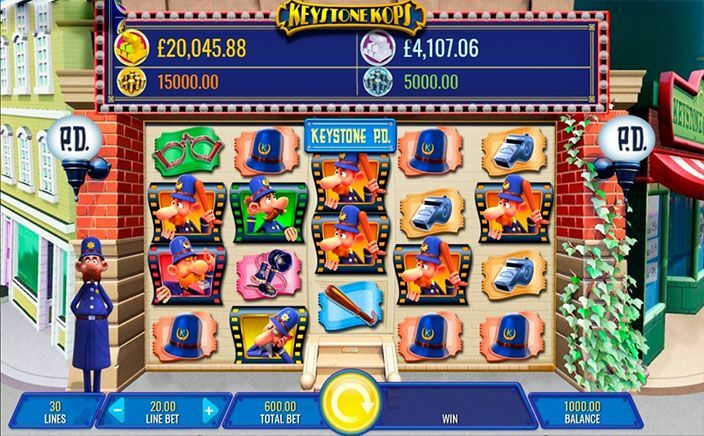 Keystone Kops is a jackpot slot developed by IGT. This is a casino game about cops in the early twentieth century. It comes with 5 reels and a dynamic range of paylines (between 30 & 100 paylines). This jackpot slot has five base game features, a couple of free spin features and one progressive jackpot feature to help boost your earnings. Continue reading the game’s review below to learn more. 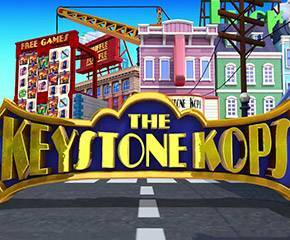 What is striking about Keystone Kops is the graphic design. The graphics come in a cartoon design done in a fun and somewhat funny way. This casino game has 5 reels and on the reels, you shall find theme-related symbols such as batons, police hats and whistles. You also have handcuffs, first generation telephones and a total of four Keystone Kops. The kop wielding a baton symbol will earn you 125 coins if you land 5 of this symbol on an active payline. You also have 3 Scatter symbols including a Vault door scatter and one Wild. This Wild icon will replace other symbols on the reels except for the vault door scatter and the other two scatter symbols. Keystone Kops has five base game features available. These include the Scuffle Shuffle Feature which is activated when the Wild symbol or four kop symbols are stacked on reel 3. These symbols will then shuffle along to other spots on the reels. The scatter icons, four kop symbols or five lesser value icons will then convert to a trigger icon. These icons can shuffle along the reels a total of five times and players can expect a prize at the end of every shuffle. The Symbol Upgrade feature will occur at random after a win. The symbols involved in the win will be upgraded to symbols with a higher payout. Low-value symbols will be upgraded to high-value symbols and high-value symbols will be upgraded to Wilds. Other base game feature in this jackpot slot include the Second Chance Bonus Trigger feature, the Mystery Multiplier feature and Shuffle Up feature. There is a Pie Patrol Free Spins feature that is activated when you have the Keystone Kops badge scatter icon displayed on reels 2 and 3. The vault door scatter should also be displayed on reel 4 for this free spins feature to be activated. You will earn 8 free spins to start with, if you are playing with 100 paylines then 2 or 3 badge scatter symbols will earn you 2 or 8 additional free spins respectively. During the free spins, players can take advantage of two extra bonus features. In this round, a chef hat that is displayed on reel 3 triggers a random wild feature. Here the central reel will transform wild. A baker will then throw some dough onto the reels converting 6 to 32 spots on the reels wild. There is also a random multiplier feature activated in the free spins round where you can earn anywhere from 2x to 10x win multipliers for every free spin. This is a very exciting jackpot slot with loads of bonus features to keep you coming back for more. The cartoon graphic design gives this game a real humour and layers will really enjoy the variety of gameplay especially with the payline range.